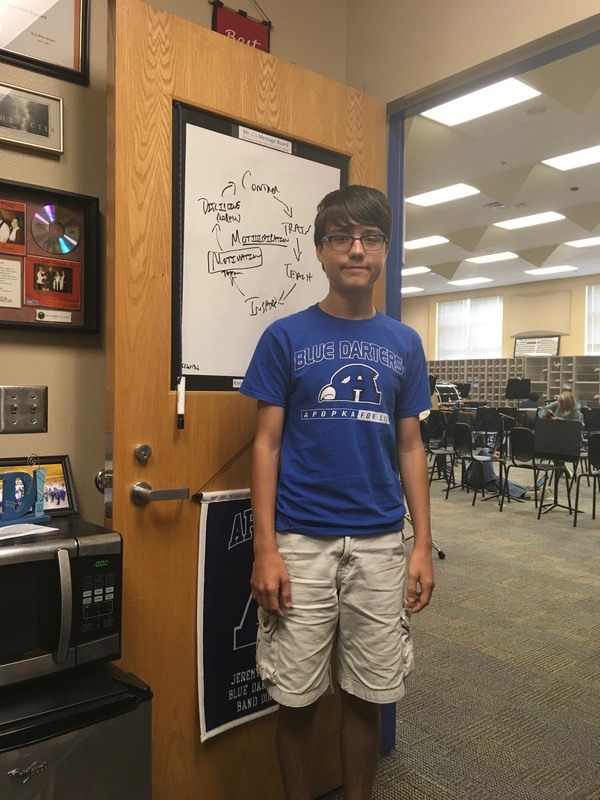 Christian is a freshmen member of the Apopka Bands and is an Eagle Scout with Troop 211 here in Apopka! Read on to learn more about his path towards Motidispiration! At what age did you begin scouting? I started scouting when I was 7 years old and in first grade. At that time, that was the youngest you could be and still join Cub Scouts. What are the biggest lessons and takeaways you have gained from the Scouting experience? There are several important lessons that I have learned from my scouting experience. I have learned how to be a leader and how to work with others. I have learned how important it is to work as a team to accomplish a common goal. Also, I have learned that to accomplish the goal, it takes hard work, determination, and perseverance. Describe from its inception your Eagle Scout project and how it has impacted our community? When it came to do my Eagle Scout project, I wanted to do something that honored the victims and first responders of 9-11. My dad is a retired firefighter and my grandfather is a retired fire chief. Not long before I began my project, my family and I visited Ground Zero where I learned a lot about 9-11. This was my inspiration for the project. My goal was to obtain an I-beam from one of the towers and to place it on top of a memorial. However, I had a difficult time even finding out the correct procedure to request a piece. My dad and I contacted many people; including many politicians. Nobody seemed to have an answer. One day, I had to appear before Apopka City Council to request permission to build the memorial. At that meeting, I met Commissioner Diane Velasquez who told me that she was a retired New York City police officer and would be willing to help. After trying some more and still not getting answers, I asked Commissioner Velasquez for help. After many long months, and thinking that maybe I could not obtain a piece of the World Trade Towers, our family received a call from the city telling us that we did get a piece of the World Trade Towers and that Commissioner Velasquez’s husband was on his way to New York to retrieve it. Then we received another call that it was not an I-beam but an outside piece of one of the towers and that it was very large. Because of this, I had to redesign the memorial. The memorial was redesigned several times before I decided on a final design. The memorial has a pentagon shaped base to honor the events at the Pentagon. The flowers represent the crash site of Flight 93. In the fountains there are two large pieces of granite that come from a quarry near the crash site of Flight 93. And of course, the panel from the World Trade Center represents the events in New York City. The panel faces toward New York City. I also decided to honor our local first responders and heritage by placing information about our city’s mayors, fire chiefs, and police chiefs. There is a place on the memorial to honor any Apopka fallen first responders, although, I hope, we never have to use that. I believe the memorial has impacted our community in many ways. First, when it was being built, many people in the community jumped in to help with the project. So not only did scouts build this memorial but the community did. Next, it allows us to remember and reflect on the events of 9-11 and for those that were not yet born, like myself, it helps teach us about those events. The memorial also teaches us about our local heritage. About a year ago, I was told that the memorial is now part of Orange County curriculum. There is a program where Apopka 4th graders can learn about Apopka history and then take a field trip around Apopka. The memorial is one stop on this field trip. This will help reach more kids and teach them about 9-11. That has always been the reason for the memorial; to help us learn, reflect, and honor those involved in the events of 9-11. What obstacles and factors did you have to navigate to complete this project? There were many obstacles. As mentioned before, I almost did not obtain a piece of the World Trade Towers because not many people knew the correct procedure to request a piece from Ground Zero. I was concerned and becoming disappointed when I thought that we would not have a piece of the Towers, but I decided I would still build some kind of memorial regardless, because it was too important of an event not to have people learn about it or remember it. The obstacle of having a much larger piece than I thought we would get once I was told we had a piece, was a good obstacle. I love the piece, but it meant the memorial had to be redesigned. The original design does not look similar in any way to the actual memorial that is outside our City Hall. Then we had some other issues trying to get the fountains to work property and finding the correct lighting we needed to light the memorial at night. The right kind of concrete was ordered but the truck showed up with the wrong kind of concrete. We just worked through these and found alternate ways to make it work. It was frustrating at times, but I just had to keep in mind the final goal. How has Scouting impacted your ability to seek mission accomplishment? Scouting has taught me many things that have helped me to accomplish my goals. First, it has taught me how to set a goal and plan the steps needed to accomplish the goal. Also, scouting has helped me develop leadership skills that are needed to accomplish goals. I have learned how to work with others, and the importance of working in a team. I have learned that unexpected things will happen and that you may have to change things from your original plan. You may have to go with the flow. Also, I have learned to push through even when you may feel disappointed; keep trying and never give up. How have you applied the lessons you have learned in Scouting into Music? Have you taken any lessons learned from music into Scouting? Are there any similarities that you have found to accomplishing what you set out to do in both venues? With marching band, you work as a team toward a common goal. I have used the skills I learned about working together in our marching band. I learned through scouts that everyone on the team has to work hard and keep up their part for it to work. Everyone has to take their portion of the responsibility for the team. I learned from music to always do your best; give it your all. I try to do that in music and scouting. Yes, in both music and scouting, I always do my best, invest a lot time and effort to accomplish my goals. What advice would you give to others about setting goals and seeing them through to the best of your ability? I would tell other to plan carefully, set small steps, invest time and effort, and be persistent. If something does not go the way you want it to, don’t give up no matter how disappointed you may feel. Be sure to always do your best. Thank you Christian for your service to our community and for your commitment to excellence in all you do! You path is an example for us all! #iegyb!